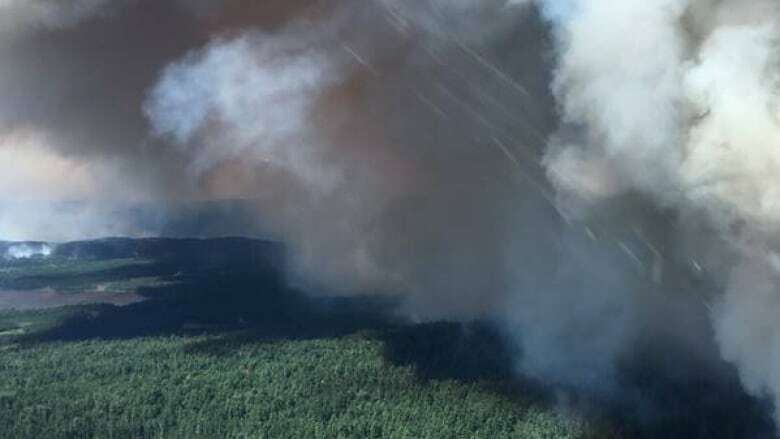 Shayne McCool, a fire information officer with the MNRF, said that the restricted fire zone now extends south of the French and Mattawa Rivers and includes areas as far south as Rosseau. That also includes the southern tip of Algonquin Park, east to Renfrew. "The risk will vary on a daily basis," McCool said. "On a [rainy] day like today, the risk for new fires is lower. The risk of finding new fires is also lower. The humidity keeps the smoke inside a canopy, making it harder to find." Designating a zone as fire restricted means the fire hazard is extreme in that area, or fire-fighting resources are stretched to capacity. The Ministry said that the use of open fires — such as campfires, or burning of brush or debris, is restricted in these areas. Failure to comply could result in fines of up to $25,000 and three months in jail for the offender, as well as shouldering the costs incurred in fighting a forest fire. Listen to the full interview with Shayne McCool in the clip below. McCool said the ministry is also aware of the concerns of cottagers as Parry Sound 33 continues to burn outside of Parry Sound, covering over 5,600 hectares. Although reports have circulated on social media of family cottages and campsites being burned, McCool said they don't have firm numbers on the damage yet. He said firefighters' focus continues to be on public safety and fire suppression, including using sprinkler systems on structures in risky areas. "It's an unnerving time for those folks, and we sympathise with them," McCool said. "All we can do is assure [them] we're doing the best we can trying to protect those structures." "We are seeing success, and will continue to do our best to make sure folks are affected less," he added. "But it's still a situation that we're still trying to manage." You can view an interactive map of the forest fires here. As of Tuesday morning, McCool said firefighters were battling 55 fires, down from 60 the previous day. 21 of those fires are not under control.